AND OF THE PRESIDENTS OF THE UNITED STATES. 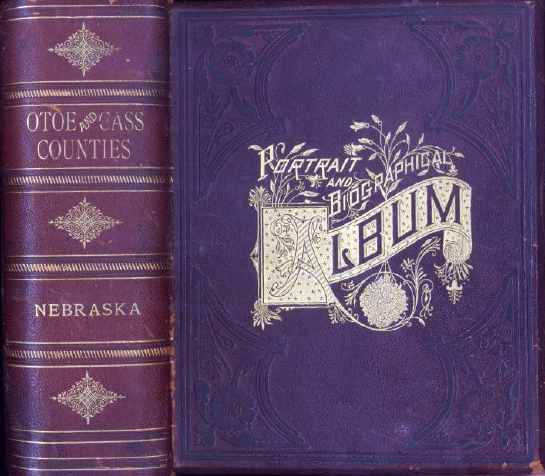 Production Notes: The Presidents & Governors pages in this book (except President Benjamin Harrison) are identical to those in the Portrait and Biographical Album of Lancaster County and have not been duplicated. To read those pages in total see <www.rootsweb.com/~neresour/OLLibrary/pbal/balc0001.htm>. Links to individual Presidents and Governors will be found in the Index. Typists contributing to this book project: Peggy Johnson, Robyn Prime, Jean Lambert, Kris Hammes, Judy Ryden and Norma Wever. This book began it's appearance on the web with a few bios provided by volunteers. Thank you! HE greatest of English historians, MACAULEY, and one of the must brilliant writers of the past century, has said: "the history of a country is best told in a record of the lives of its people." In conformity with this idea the PORTRAIT AND BIOGRAPHICAL ALBUM of this county has been prepared. Instead of going to musty records, and taking therefrom dry statistical matter that can be appreciated by but few, our corps of writers have gone to the people, the men and women who have, by their enterprise and industry, brought the county to a rank second to none among those comprising this great and noble State, and from their lips have the story of their life struggles. No more interesting or instructive matter could be presented to till intelligent public. In this volume will be found a record of many whose lives are worthy the imitation of coming generations. It tells how some, commencing life in poverty, by industry and economy have accumulated wealth. It tells how others, with limited advantages for securing an education, have become learned men and women, with an influence extending throughout the length and breadth of the land. It tells of men who have risen from the lower walks of life to eminence as statesmen, and whose names have become famous. It tells of those in every walk in life who have striven to succeed, and records how that success has usually crowned their efforts. It tells also of many, very many, who, not seeking the applause of the world, have pursued "the even tenor of their way," content to have it said of them as Christ said of the woman performing a deed of mercy--"they have done what they could." it tells how that many in the pride and strength of young manhood left the plow and the anvil, the lawyer's office and the counting-room, left every trade and profession, and at their country's call went forth valiantly "to do or die," and how through their efforts the Union was restored and peace once more, reigned in the land. In the life of every man and of every woman is a lesson that should not be lost upon those who follow after. Coming generations will appreciate this volume and preserve it as a sacred treasure, from the fact that it contains so much that would never find its way into public records, and which would otherwise be inaccessible. Great care has been taken in the compilation of the work and every opportunity possible given to those represented to insure correctness in what has been written, and the publishers flatter themselves that they give to their readers a work with few errors of consequence. 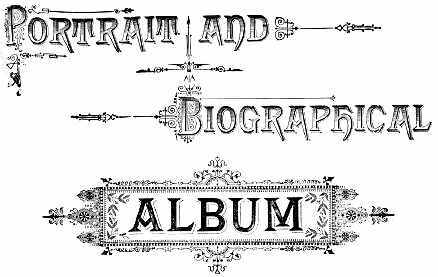 In addition to the biographical sketches, portraits of a number of representative citizens are given. The faces of some, and biographical sketches of many, will be missed in this volume. For this the Publishers are not to blame. Not having a proper conception of the work, some refused to give the information necessary to compile a sketch, while others were indifferent. Occasionally some member of the family would oppose the enterprise, and on account of such opposition the support of the interested one would be withheld. In a few instances men could never be found, though repeated calls were made at their residence or place of business. CHICAGO, November, 1888. CHAPMAN BROS.